Politicians are getting set for a fight with powerful state governors. Some APC senators and aspirants have opposed the Wednesday decision of the party, which granted the request of the governors on the mode of primaries for choosing candidates for the 2019 elections. The APC National Executive Committee, after its meeting last month, had announced the adoption of the direct method of primaries for choosing candidates. What happened that APC now surrender to Governors? The party initially said states that preferred the indirect method must get the approval of all stakeholders and write the national secretariat. The letter is expected to be signed by a majority of members of the state executive committee. 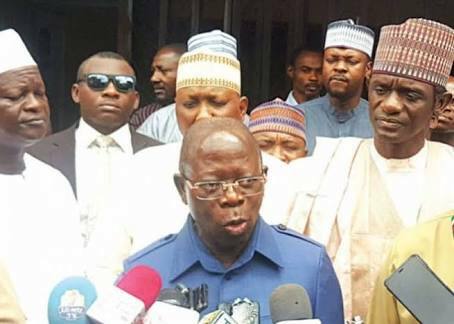 But after his meeting with the governors on Wednesday night, the APC National Chairman, Adams Oshiomhole, said state chapters of the party were (now) free to choose any mode of primaries. In separate interviews with The Punch, some senators and aspirants opposed the power given to the governors by the party. Some of them denied knowledge of the U-turn made by the Oshiomhole-led National Working Committee of the ruling party, which allowed states to adopt indirect mode of primaries to elect candidates for the 2019 general elections. In his submission, Senator Kabiru Marafa, who said he was not aware of the leeway given to the APC governors to adopt indirect primary mode, said the decision would mark the beginning of the end of the ruling party. Marafa, who had a few weeks ago told The Punch exclusively that he would participate in parallel direct primaries to be conducted by the faction of APC led by him in Zamfara State should Governor Abdulaziz Yari insist in the indirect mode, noted that Oshiomhole might have been under pressure to back down on direct primaries. The senator said, “One, I am not aware of it. Two, I don’t want to believe that the party under Oshiomhole would concede to that because, like I have always said, he is a man of integrity. My little interaction with him shows that he is committed to building a stronger party. I don’t know how he is going to build a stronger party by shying away from the electorate. Anybody who is afraid of facing the electorate has no business in politics. According to the lawmaker, courts will soon nullify congresses that produced the current state executives who have been billed to conduct the proposed indirect primaries. Shehu has been an ardent critic of indirect primary, insisting that it breeds corruption. In a related development, a former Minister of State for Health Dr. Ali Pate, has said the APC can lose Bauchi State if it goes ahead with the indirect primary and presents an unpopular governorship candidate. Pate, who is also aspiring for the APC ticket to contest the governorship election, said this in an interview with journalists in Abuja, on Friday. He spoke after he was screened by the APC panel set up to screen governorship aspirants. Pate said the preference of most aspirants for the direct primary was to eliminate corruption and provide a level playing field for all aspirants to truly test their popularity with the electorate starting with card carrying members of the party. Pate said, “We have made our case, if the party wants to win Bauchi State, it should put forward a credible, popular candidate. At this point, we know that the mass of people in Bauchi State are worried that an imposition will not stand well in the general elections. Some aggrieved APC senators are said to be making moves to decamp already.